In honor of Black History Month, this article will examine the life and work of the first African American author to win the Newbery Medal—Virginia Hamilton. Virginia Hamilton won the Newbery Medal for M. C. Higgins, the Great in 1975. This is also the first work ever to win both the National Book Award and the Newbery Medal. Her work has won many other awards, including multiple Newbery honors; the Hans Christian Andersen Medal, which is the most distinguished prize in children’s literature; and the Laura Ingalls Wilder Award for lifetime achievement. Hamilton’s work was greatly influenced by her upbringing in Ohio surrounded by a loving family of talented storytellers. She went on to attend Antioch College and then Ohio State University, where a teacher encouraged her to go to New York City to be a writer. Hamilton moved to New York City in 1955 and worked odd jobs while continuing to write. Her first novel, Zeely, was published in 1967. It was typical of the stellar work that would be produced throughout her career. Her next book was The House of Dies Drear, which won the Edgar Award. It is a mystery that centers on the history of the Underground Railroad. This book is still beloved today and is inlcuded on many school reading lists. The Newbery Award-winning M.C. Higgins the Great is a story that emphasizes the importance of family, like much of Hamilton’s work. It is about the Higgins family, who reside on Sarah’s Mountain in Southern Ohio. Strip mining threatens the home and safety of the family and the main character M. C. searches for a solution to protect both. Hamilton has written many more books, working up until her death in 2002. To find more of Virginia Hamilton's works, please visit our online catalog. 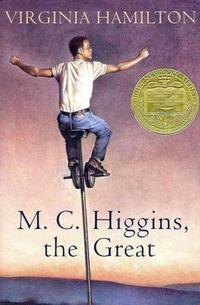 Virginia Hamilton won the Newbery Medal for M. C. Higgins, the Great in 1975.